When one dreams of a dream boat, what might that be? In 1900, it would have been a Herreshoff-designed colossus intended for the America’s Cup. In 1936, Mike Vanderbilt had Starling Burgess design him the last of the great J Boats of that decade – Ranger. In the 2010s, ultimate yachts have a new look: multiple hulls. When Phil Lotz and Wendy Darling Lotz (full disclosure: they are my brother-in-law and younger sister) thought “new boat,” they saw what I call a “mega cat” – a fully-featured, carbon constructed, high performance offshore cruising speedster called Arethusa. The history of cruising cats and tris is a fascinating one, replete with eccentric designers and colorful builders. In the U.S., multihull designs derive from the model of Herreshoff’s Amaryllis, a replica of which is now on the ceiling of the Herreshoff Marine Museum in Bristol, RI. * In the 1960s, liveaboard catamarans were homebuilt on the West Coast in plywood, cement and eventually fiberglass. The development of the one-design Corsair F-line of trimarans brought multihull cruising to a broader market. European designers led by the French have populated Caribbean charter fleets with their designs. Just examine sailing magazines today and count the cruising multihull ads. 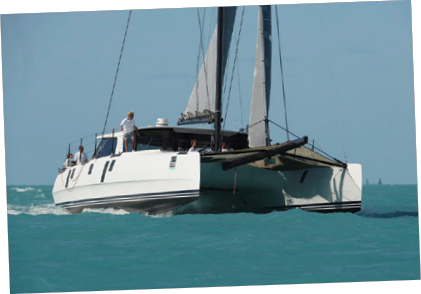 After racing a Frers-designed Swan 42, Phil and Wendy decided on an ultimate multihull yacht. When they surveyed the options, their choice was a second generation Gunboat design, a line originally designed by the Californian shop Morrelli & Melvin. Designer and engineer Pete Melvin is a credentialed world-class cat sailor who represented the U.S. as the Tornado skipper in the 1988 Olympics. The history of the Gunboat concept of high performance racer/cruiser catamaran started with Peter Johnstone, son of J Boats co-founder Bob Johnstone. With the original designs done by Morrelli & Melvin and built in South Africa, Gunboat has produced models from 40 to over 60 feet over the past 15 years. The Hudson plant is in Xiamen, China, south of Qingdao, the site of China’s Olympic sailing venue. The facility produces a variety of sporting goods from helmets to baseball bats. It may be a surprise to us here in the U.S., but “Made in China” is one of the benchmarks for excellence in performance catamarans. (Gunboat has recently been purchased by a French cruising cat manufacturer, Grand Large Yachts, which plans to feature the Gunboat design as their top of the line model), according to an article in the January issue of SAIL. Phil and Wendy’s Gunboat 60 is their second Arethusa. The name comes from a Greek water nymph who fled an overzealous god. The symbol of circular leaping dolphins derives from a Hellenic site and was a common motif on classical coins. It makes for a great spinnaker logo! The key dimensions of the Gunboat 60 are 60 feet at the waterline with the reverse chine bows one sees in modern smaller racing cats, 30 feet of beam, 100-foot high mast and 15.5 tons of displacement without the crew (which averages 1,300-1,500 pounds). “There was quite a bit of discussion on details and the interior,” said Phil. New innovations for the Arethusa model included rig improvements and the addition of extra solar panels to satisfy the thirst for electrical power of modern electronics and conveniences. Beginning in the summer of 2013, Team Lotz worked with the Gunboat team on the rigging and layout, and had the big cat shipped to Newport, RI for August 2015 delivery. After four trips by the Lotz’s to Xiamen, which is 180 kilometers north of Shanghai, the boat went by freighter to the Northeast. Meanwhile Hall Spars & Rigging of Bristol, RI built the rig. It all came together in August, 2015. The Gunboat 60 is a second generation design following the Gunboat line developed since 2002. The concept and configuration of the 60 is similar – two carbon-reinforced hulls with the heads and berths inside – some fore and aft, some athwartship. Those hulls are connected by a bridge deck enclosed for the galley, living area and the navigation and steering stations looking forward through huge windows (larger than those of a commercial airliner) that open to the working cockpit forward of the wing-shaped mast. The sails are set, trimmed and handled from this double hot tub-sized crew cockpit. The spaghetti-like complexity of colored halyards, sheets and control lines is daunting. Centerboards in each hull pivot up inside the hulls. The clues to aerospace heritage are everywhere; for a 32,000-pound boat, an airplane’s worth of carbon makes up the hulls. The total effect is of an ultramodern, superwide personal jet ready to hit the water. The rigging is deceptively simple. The square-topped carbon fiber main launches with halyard locks and trims to an aft traveler that goes 2/3 of the width of the boat. Jibs, from a storm jib to a high-top reacher, launch off the forestay and trim to electric, foot pedal-controlled winches and a cluster of jammers behind the mast. 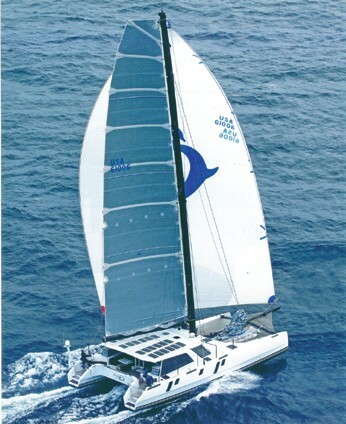 The asymmetric spinnaker also launches forward and trims to winches fully aft on the two hulls. It’s a lot of sail to be manhandled. The #1 reacher requires four people to muscle it on and off the dock, says Phil. Crewing a 60-foot, 16-ton catamaran presents different challenges from sailing conventional grand prix boats. The skipper has the option to drive from inside or outside the coachroof, usually inside starboard of amidships to give the pit crew their space. It takes 4-5 crew for a straight line delivery and Team Lotz races with 8 to 10. Of those, two younger and more agile sets of hands handle the bow. The other difference in controlling these mega cats is dealing with the prodigious power created by all that sail area (more than 1,500 square feet in the main alone, plus headsails up to 1,100 (gennaker) and 3,200 square feet (spinnaker)…this evokes the J Boats of the 1930s, large crews of professional sailors handling acres of cotton canvas to go out racing on the waters off Newport…There is a red button at Arethusa’s steering station. That is the emergency brake, so to speak. Push and you blow the mainsheet, itself a piece of Kevlar the size of an electrical cable. After commissioning at New York Yacht Club Harbour Court in Newport (Phil is currently NYYC Commodore), the extended Darling and Lotz families including the veteran sailing grandparents took their first spin on Arethusa in September, 2015 on a cool, breezy afternoon during the 12 Metre North Americans. Mastering the halyard locks on the enormous, full-battened main took some practice, even for the two seasoned pros working the sail trench. There were some moments of trepidation as we drifted toward the omnipresent cruise ship anchored off Goat Island, but we finally got the main to cooperate. With a storm-sized jib and full main, we headed north up Narragansett Bay under the Newport Bridge with the intent of circumnavigating Conanicut Island. The sensation of speed on Arethusa is very deceptive until you look around and realize that at 15 knots upwind in 18 knots true, she’s going two times the speed of a 60-foot grand prix monohull. It’s not a quiet ride, but absent big ocean waves the ride is smooth enough to not spill a glass of water in the galley. The plan with the northerly breeze was to head north of the 12 Metre fleet, who were rail down in the 18-knot breeze, then circle the island counterclockwise. We passed Courageous, the 12 Metre fleet leader, so fast we barely left a wind shadow, then bore off west and headed down the West Passage toward Newport. As one would expect, it is downwind that a cat shines. A progression of high clew, lighter composite reachers provide the power that pushes the speed to 20 knots plus. Given the crew, the wind speed and the shakedown cruise, the spinnakers had remained on shore. In the photo, you can see what 2,700 square feet of Gunboat 60 asymmetrical looks like… We relaxed in the chilly sun, tacking downwind under the new Jamestown Bridge, while we rigged up for what we thought a mega cat really like – reaching. When we hardened up onto a port reach heading east in a building northerly coming off Beavertail, we lit up the speedo. Full main and smallest jib pushing the needle consistently up and over 20 knots, the boat bouncing on a 3-foot chop. Now, this is what performance cat sailing is about. As we beat our way back to the mooring, we got it. Speed, power, and my 80-something parents never spilling their cocktails: that’s why you deal with these mega cats. 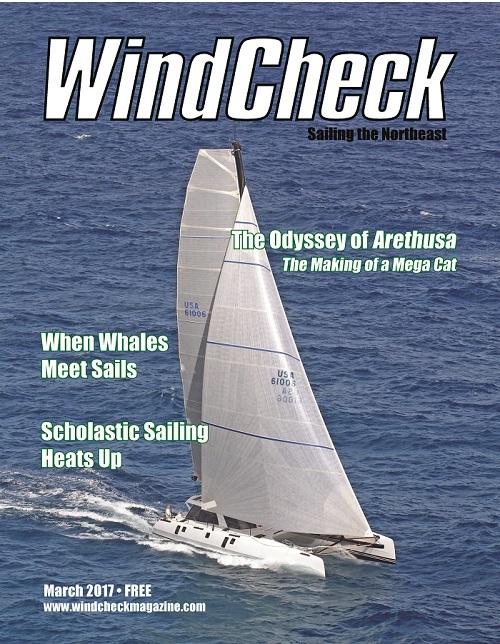 Since fall 2015, Arethusa has had a progression of shakedown cruises and day races (including the New York Yacht Club Race Week at Newport presented by Rolex) to acquaint the crew with the nuance and power of a boat that would easily pass a J Class sloop, either on an offshore reach or inshore around the buoys. Arethusa winters at Phil and Wendy’s Ft. Lauderdale home. Given the right weather, she has the power to dash up and down the Gulf Stream in as little as four days between South Florida and Rhode Island, her summer home. When I talked to Phil and Wendy, Team Lotz had just finished the Ft. Lauderdale to Key West Race and were preparing for Quantum Key West Race Week and the 2017 Caribbean racing circuit, with upcoming events including the St. Maarten Heineken Regatta (March 2-5) and the BVI Spring Regatta (March 27- April 2). They expect six to 10 big multis for these events, with Gunboats 55 feet and up as well as other emerging varieties of big cats and tris. Arethusa and her speedy rivals will surely rival the J Class sloops for the eye of the yachting photographers. *A revolutionary 33-foot catamaran, Amaryllis was designed by Captain Nathanael Green Herreshoff in 1876. After sailing her from his shop in Bristol, RI to New York City (200 miles in only 14 hours! 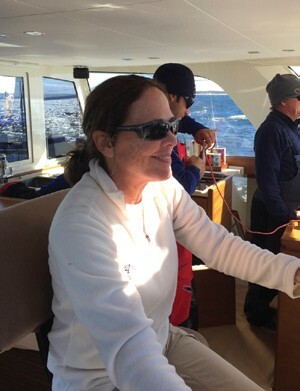 ), Captain Nat entered her in the New York Yacht Club’s Centennial Regatta in New York Harbor. The radical cat so thoroughly trounced all comers that she was disqualified, which led to the barring of catamarans from conventional yacht races for many years. – Ed.